The Question of the Day (writing prompt) for the second graders yesterday was, “What surprise might a farmer find if he or she planted seeds?”. Some children, after considering the question, remembered Jack and his giant beanstalk. Well, that WAS a surprise to Jack. Other students came up with other creative ways to answer the question. But me, I was reminded of a surprise we received a couple years ago. My husband and I wanted to spruce up the little patch of ground we have in front of our home. We live in an urban residential area on a main street, with many houses turned into rental units, and small shops and businesses surrounding us, so our front yard is a small area with trees and hedges that meets a sidewalk. With Fourth of July approaching, and our community’s first annual holiday parade soon to march past, we wanted to make our front yard look its best. We went to a nursery to select a few foliage plants that would do well in that partly-shaded area. Maybe we would add some grass seed too, although now I can’t remember if we did. What I knew was that, by the time we finished working on our project, we would have a prettier natural facade to our home that would include our shade-providing dogwood tree with bird feeder, a few colorful foliage plants, an evergreen tree that came from a Christmas past, and some new paving stones we purchased to build up the retaining wall. We would feel proud of our little patch when the parade would pass by. A secret to our successful gardening efforts would be compost soil. 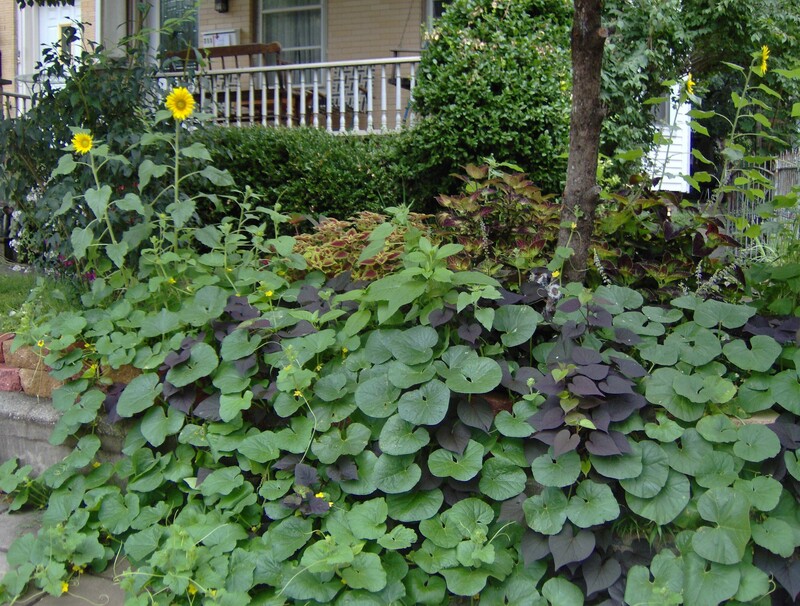 When I met my husband, I discovered that he was adamant about recycling and composting. These had been semi-foreign concepts to me, but I eventually learned what the numbers on the bottoms of the recyclables meant, and that all vegetable matter could be composted. What a great idea, composting; we could put the waste in the compost bin and little insects would go to work, assisting the material to break down to become useful soil. And now this useful soil would become part of our beautifying project. Okay, so it didn’t smell so great. But the plants thrived in it. We watered and we watched and we watered. Things were growing and becoming greener, and we felt proud of our efforts. We did a good job. And then things continued to grow and grow and, wait a minute – what’s happening? Sunflowers began to spring up all around. We hadn’t planted any of those, but there they were! Thanks to the help of our feathered friends, sunflower seeds from our bird feeder made it to that fertile compost soil and Mother Nature did her thing. 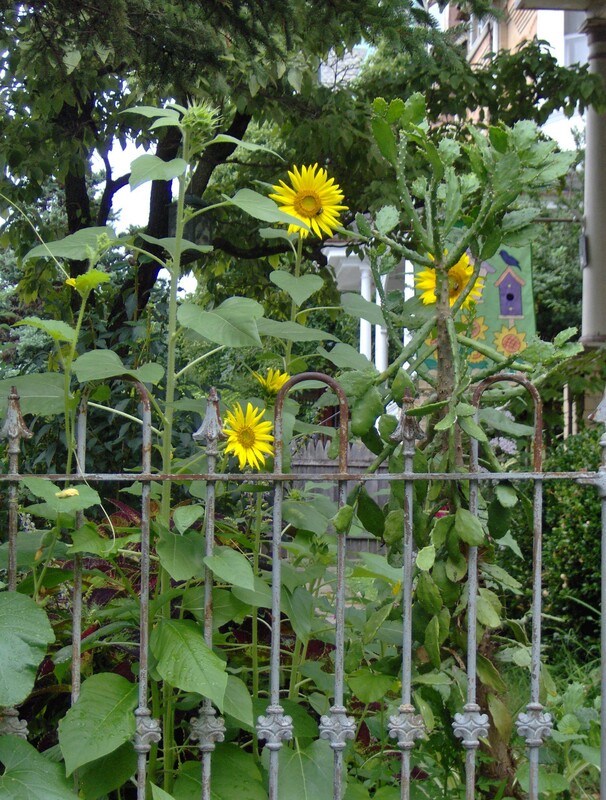 What a nice surprise and a bright yellow joy to behold: sunflowers on our busy urban street! The sunflowers were a great surprise! 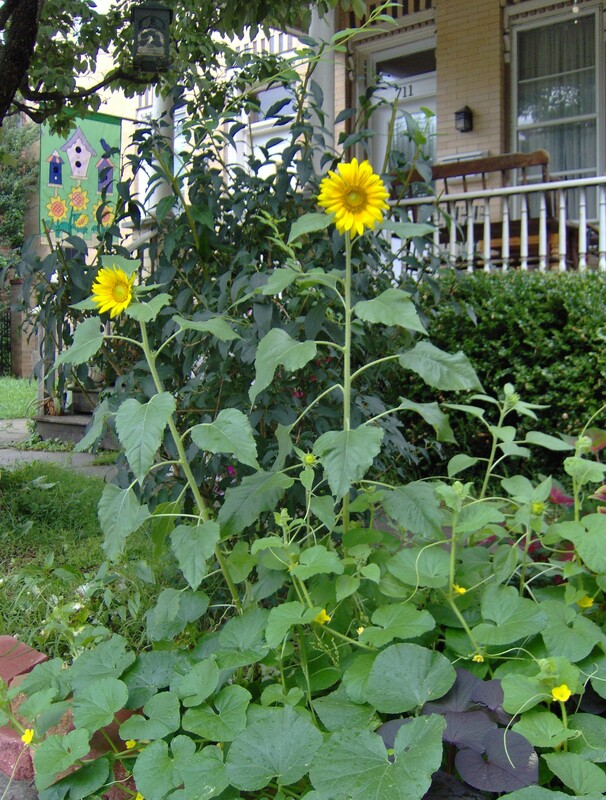 You can see a tall cactus enjoying the sun, side-by-side with the sunflowers. That was an indoor plant that we brought outside for the summer. « Happy Birthday, Edward James!